I made them in a weird and wonderful studio called Padded Sell. Being a creative type, I wanted my dream studio to be distinctly and delightfully abnormal. Hi-touch, not hi-tech. A place of beauty, surprises, and smiles. My brief to designer Mike Ting was to create “a Victorian gentlemen’s club on acid”. Which he did, superbly. Burglary was never an issue for us. That’s because Mike’s waiting room had no doors. The route to the studios was via bookcases that swung open. The reception desk looked like a fireplace. Clients waited for their bookings in old green leather hairdryer chairs. vestments that looked as though they were being sucked into the air-conditioning vents. 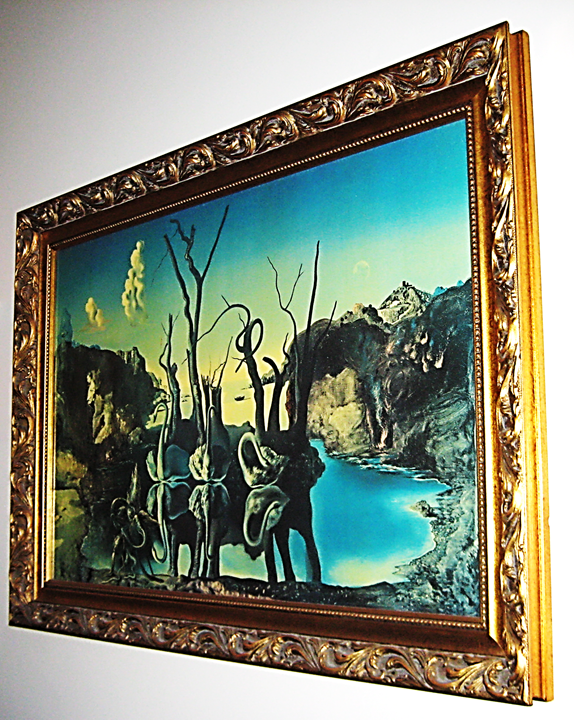 Adorning the walls were surrealist paintings, like this one, Swans Reflecting Elephants, by the greatest and looniest of artists, Salvador Dali. But my favourite Padded Sell artefact was the custom-built desk on which our recordings were lovingly crafted by my master sound engineer Evan Roberts. Evan agreed that we should avoid the typical recording studio ‘cockpit of the Enterprise’ look. He suggested a long floating table, with a stack of books under one end, and nothing under the other. I called in woodworking wizard John Calvert, and regaled him with my love of Dali and Dr Seuss and smoothness and symmetry and silliness — and Evan’s idea. 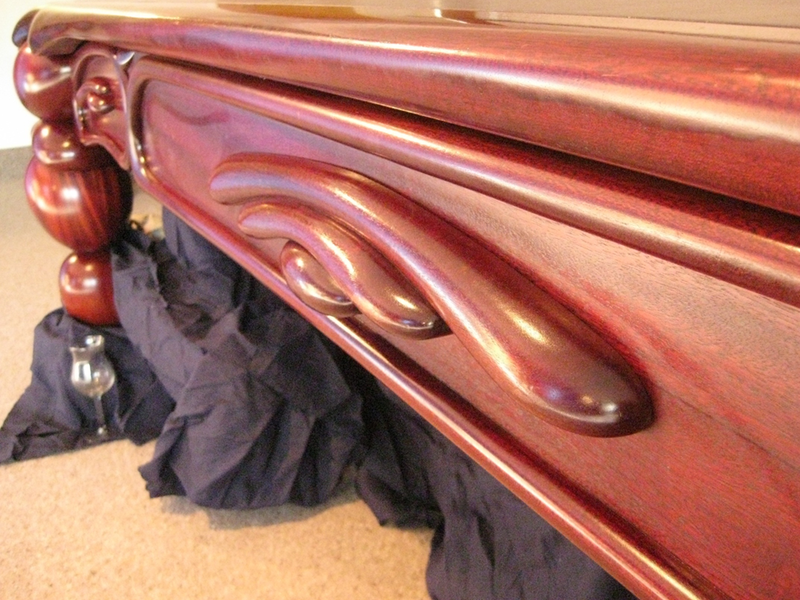 His response was this molten mahogany masterpiece. Above is the only photo I have of it in situ. 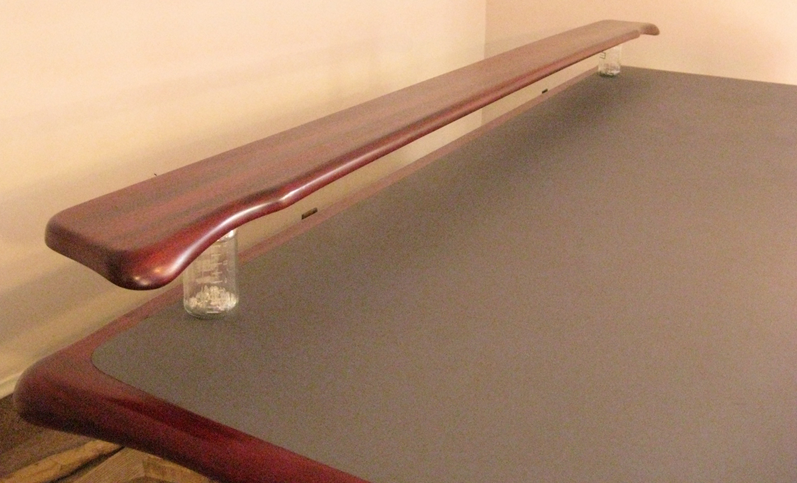 Below is the floating table today, reassembled and temporarily propped up in the basement. I wish I could present it to you more elegantly, but I won’t be Mr Popular if I Ramset the back support frame through the carpet! 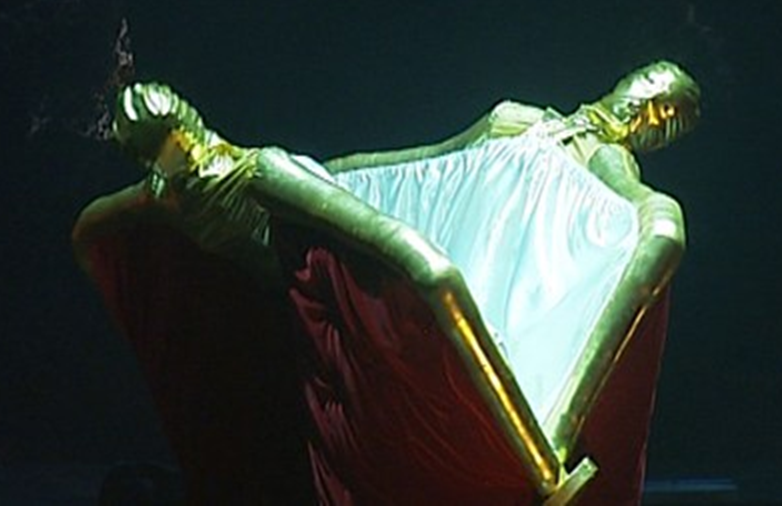 When the frame’s in place (covered with a curtain), the table seems for all the world to be suspended in midair, with no back legs at all, and two absurdly muscular amputated front limbs that rested implausibly on oversized wine flutes. I closed my dream studio in 2000 when a new landlord decided to turn The Breeze Plaza into flats. As you can see, back then I had more money than sense. Now I’ve got just as little sense, and a lot less money. And since I need money if my Treatygate/Colourblind State campaign is going to work, I’m reluctantly prepared to let my beloved table go if someone values it highly enough. 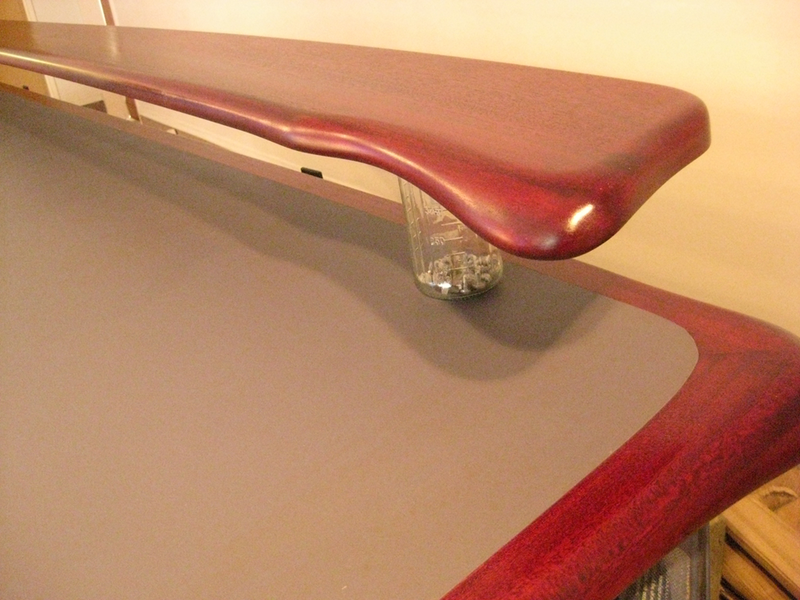 Without the back bracing to hoist the table up, the wine flutes don’t quite nestle underneath. But you get the idea. And don’t you love those beautifully-scalloped drawers? The table has spent the last twelve years lovingly wrapped in crinkly cardboard, so it’s pretty much ‘as new’. I just love John Calvert’s design and craftsmanship. Use him if you can. I think he told me he was having an exhibition at The Dowse. (Open to both sexes, I hope. :-)). I’m not letting my table go lightly. After a costly divorce, a studio sabotage, and my habit of walking away from political campaigns, I suspect it’s the most valuable thing I own. 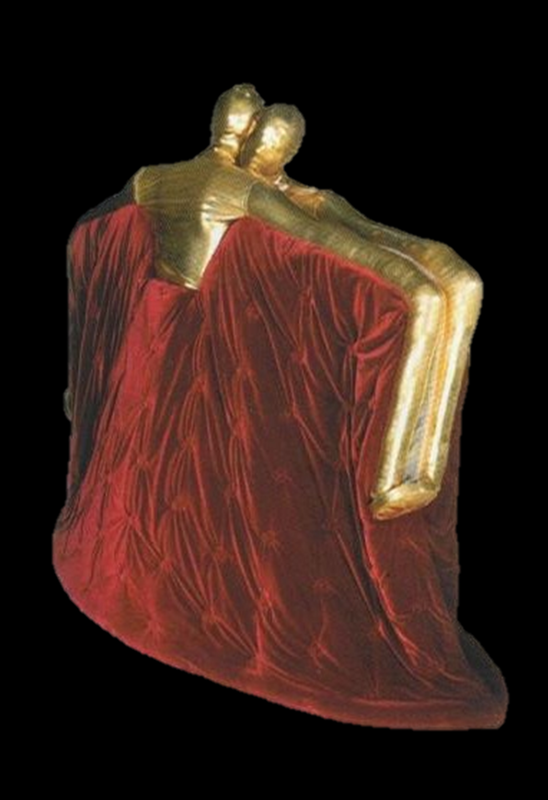 But if you’d like to own this highly unusual piece of furniture, I’d be happy to consider your offer. I’m offering it here first, in the hope that it may go to one of my loyal readers. If there are no takers after a few days, I’ll list it on TradeMe and E-Bay — in case a Neil Finn or a Billy Joel is looking for a new workbench. The shelf is an optional extra. I can’t seem to find the support struts, so I’ve propped it up on bottles. The shelf is an optional extra. 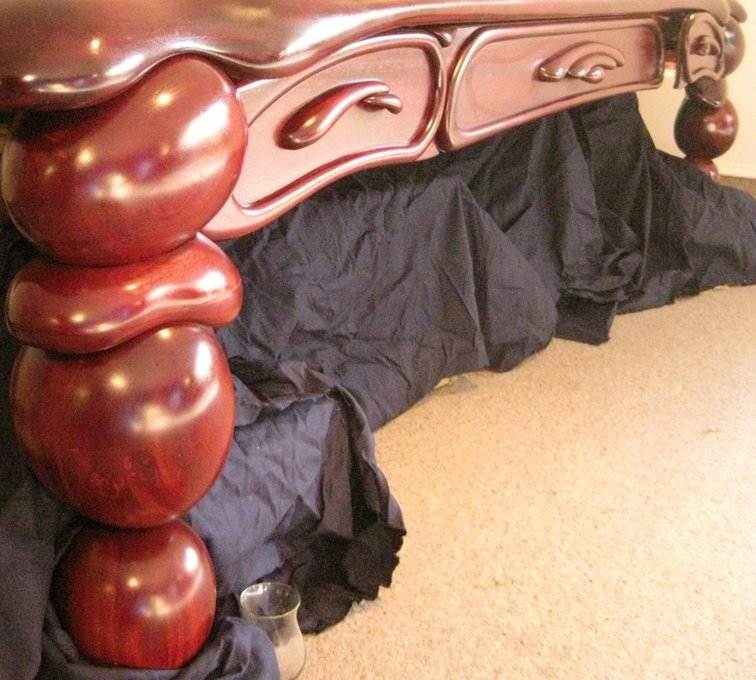 If you think my old table should be your new table, write to me at john@johnansell.co.nz. If you have any well-to-do friends who might fancy it, send them the link. I’m not sure what passes for a well-read blog round these parts. All I know is that the visitor numbers to this one have been growing every day for the past week. 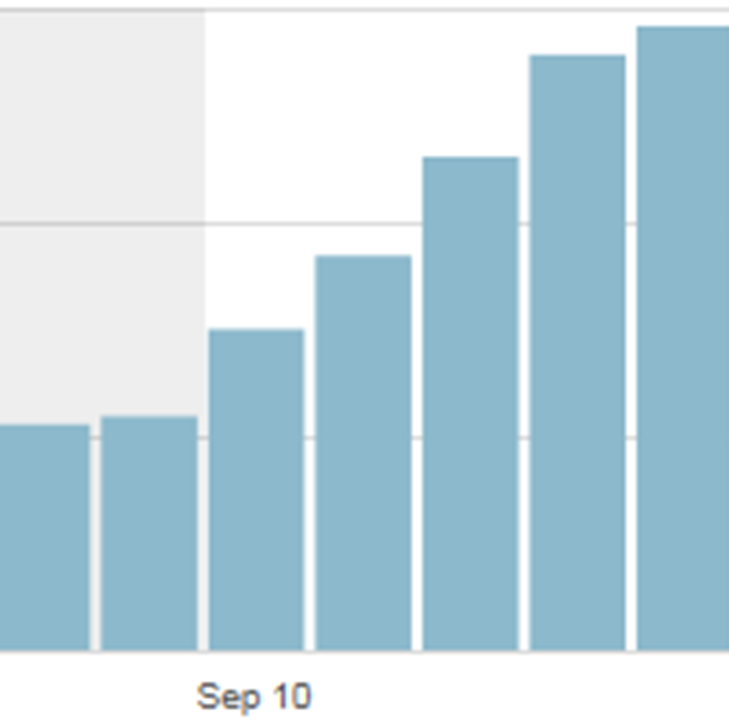 The horizontal lines on this Visitor Stats graph represent 500, 1,000 and 1,500 visits a day. Yesterday’s total was 1,485 — the most visits I’ve had since my first day of blogging in 2008, when 1,676 tuned in (thanks to a welcome link from David Farrar). I’ve been an irregular blogger over the years. When I do nothing, I average about 200 visits a day. Since beginning my Treatygate/Colourblind State posts, those numbers have at least quadrupled. We’ve got a long way to go, but it’s good to see evidence of rising interest. For an irregular blog obsessed with things New Zealand, this one certainly gets around. I’m gobsmacked to learn that, in the last six months, readers have come from 159 countries, from Jamaica to Gibraltar to Djibouti to Japan, from the Bahamas to Botswana, from Nepal to Senegal, from Ghana to Guyana, and from Thailand to Greenland (where lives Qivioq, my Eskimo filmmaker friend). Other ‘lands’ I’ve accidentally conquered include England, Finland, Iceland, Ireland, Poland, Scotland and Switzerland. I’ve made inroads into Azerbaijan, Afghanistan, Pakistan and Tajikistan, but not yet made benefit glorious nations of Kazakhstan, Kyrgystan or Turkmenistan. Given my right-of-centre leanings, I’m delighted to be re-educating comrades in communist China, Myanmar and Vietnam, but less surprised by my lack of a following in North Korea, Cuba and Iran. I didn’t realise till I scanned the reader stats how many countries end in ‘ia’. Those on my list of intermittent indoctrinees include Albania, Algeria, Armenia, Australia, Austria, Bosnia, Bulgaria, Colombia, Croatia, Estonia, French Polynesia, Latvia, Lithuania, Malaysia, Mongolia, Namibia, New Caledonia, Nigeria, Romania, Russia, Serbia, Slovakia, Slovenia, St Lucia, Syria, Tunisia and Zambia. No contact yet with Ethiopia, Macedonia, Mauretania, Somalia or Tanzania. It’s ironic that Oblivia (I mean Bolivia) is the only major hold-out in South America, since that happens to be the South American country in which I’m most interested. Griever Maori like Margaret Mutu and Nin Thomas hold up Evo Morales’ pro-indigenous Bolivian constitution as a template for New Zealand, so a post on that nightmare scenario ought to mop up that pocket of resistance. Anyone know anyone in the grey countries? What about dropping them a link?